Vicky Pelaez: Journalist, Radical, Russian Spy? Yonkers resident Vicky Pelaez, one of the 11 accused Russian spies, will be released on $250,000 bail, as the judge said she did not appear to be trained as a spy at the hearing yesterday evening. Pelaez is a well-known reporter and columnist of the Spanish-language New York City newspaper El Diario/La Prensa known for her sharp criticism of the U.S. and her sympathy for radical left-wing politics. She has praised former Cuban president Fidel Castro and Venezuelan President Hugo Chavez, CNN reports. Pelaez won’t be released until Tuesday, which gives prosecutors time to appeal the bail. She will be under house arrest and wear an electronic ankle bracelet. Further, as a respected journalist whose supporters had gathered outside the courtroom during the hearing, Pelaez has a reputation to defend and is therefore unlikely to jump bail, they said. "Vicky's case is more complicated," said Manhattan federal court judge Ronald Ellis. "She does not appear to be a trained agent. She has a real identity and she is a U.S. citizen," However, he did note that, according to evidence submitted so far, Pelaez appears guilty to some degree. 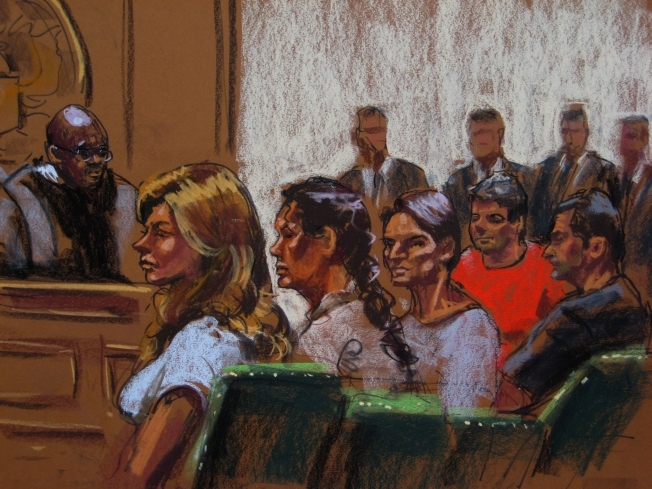 By contrast, Judge Ellis denied bail to suspected spies Cynthia and Richard Murphy of Montclair, NJ, saying that their real names and identities could not be determined and that there was a danger they would leave the country. Immigration and international human rights lawyer Eva Golinger told NBCNewYork that Pelaez is "one of few journalists in mainstream Hispanic media who criticizes US policy towards Latin America and immigrants, and her arrest could be indicative of an attempt to silence her voice and writings," in an emailed statement. The eleventh member of the alleged spy ring, Christopher R. Metsos, was arrested in Cyprus on June 29, but was released on €20,000 ($25,000) bail and subsequently vanished. Pelaez, a Peruvian-born U.S. citizen, has been a well-known Spanish-language journalist for over thirty years. She began as a TV reporter for Peru’s evening news show Frecuencia Latina, one of the country’s first female reporters. Called “the most aggressive journalist on TV” by Peruvian magazine Teleguia, Pelaez was known for her street reporting and live stand-ups, which changed the next generation of Peruvian journalism, the NY Daily News reports. In 1984, the Tupac Amaru Revolutionary Movement (MRTA), one of Peru’s leftist guerrilla movements, kidnapped Pelaez and her cameraman Percy Raborg. The group demanded that Pelaez’s station broadcast a prepared propaganda video in exchange for Pelaez’s and Raborg’s release. The station agreed after only a few hours of the demand, and the journalists were released shortly thereafter. Pelaez soon after moved to the U.S. and became a citizen. However, some -- including Raborg -- have raised suspicion that Pelaez might have been complicit in her own kidnapping, the NY Daily News reported. Upon moving to New York she began working at El Diario/La Prensa and married Juan Lazaro, another accused spy who claimed in court yesterday that “he would not violate his loyalty to the ‘Service’ even for his son,” according to court documents. El Diario/La Prensa reports today that Pelaez’s family does not know Lazaro well and thought their marriage was abrupt. Lazaro, a retired CUNY professor, lived with Pelaez in a Yonkers apartment which federal agents had been bugging “for years,” court documents claim. He has two sons, the younger of which is Pelaez’s as well. Both Lazaro and Pelaez reportedly admired Shining Path, the Peruvian Maoist guerrilla army. And since Maoists generally consider the Soviet Union and even more so the current Russian Federation as their enemies, friends thought it strange that any Shining Path supporters could also be Russian spies, said NY Daily News. The couple was arrested on June 28th, the same date as the other alleged spies; while driving back to their Yonkers home with their seventeen-year-old son, two FBI vehicles intercepted them, El Diario reports. Waldo Mariscal, Lazaro's son and Pelaez's stepson, 38, said that approximately 30 agents then "entered the home and removed boxes of documents, computers, and electric equipment" and questioned both sons. “My parents hardly know anything about computers," Mariscal said when asked if his parents had any spying machinery. "Sometimes they don't know how to make their Yahoo account function." Prosecuting attorney Michael Farbiarz says that Lazaro has claimed that, although his sons did not know about his spying, his wife Pelaez did, El Diario reports. “It’s a lie!” Pelaez’s son responded. “He’s said it under duress. He’s elderly and doesn’t understand English very well,” he told El Diario. One of Pelaez’ lawyers, Carlos Moreno, said that Pelaez had told him she was totally innocent of all the charges, El Diario/La Prensa reports. She is accused of having received money from a representative of the Russian government on various occasions. The complaint also includes accusations of disseminating information to Russian agents in the form of notes written on invisible ink. After Pelaez was granted bail last night, another defense attorney told reporters that Pelaez "was very happy because this would give her opportunity to explain what has been going on to people who, after her arrest, had passed quick judgment as to whether or not she was a Russian spy or not."